In 1788, a group of London gentlemen, concerned about the plight of the many destitute and homeless children on the city's streets, founded the Philanthropic Society. 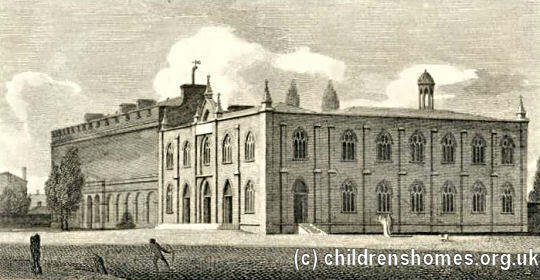 Later the same year, the Society opened an institution at St George's Fields, Southwark, for the children of convicts and for those who had themselves been convicted of crime. In the early 1800s, male and female 'Reforms' were opened on the site where the boys and girls were occupied in making shoes, clothing, rope and other goods. A large chapel was added in around 1805. In 1849, the Society relocated its activities to Redhill in Surrey where a Farm School was established. The new School was for boys only, and the children of convicts were no longer admitted. The move was prompted by visits made by supporters of the Society to the 'agricultural colony' for delinquent boys at Mettray, near Paris. The boys at Mettray lived in 'family' groups, and the establishment was proving successful in providing a remedial environment for juvenile offenders. A similar system was adopted at Redhill, with 'houses' of around 60 boys each being being supervised by a married couple. The new buildings were designed by William Bonython Moffatt who, with his former partner, George Gilbert Scott, had previously designed many workhouses. The cross-shaped layout of the main Redhill building had echoes of his earlier work. On September 2, 1856, the School became officially certified Reformatory, taking boys placed there by the courts, usually for at least four years. 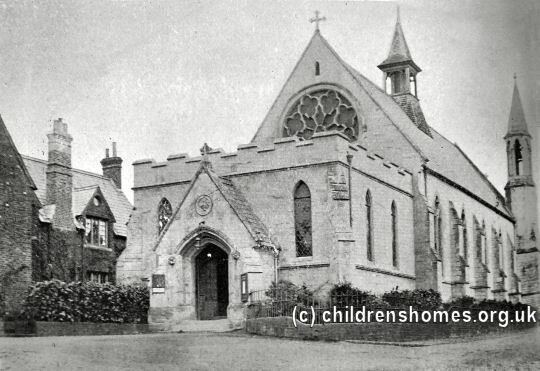 The School had accommodation for up to 300 boys aged 12 to 16. The original houses at the site were named Queen's Prince's and Duke's. It was later decided that the groups of boys should be located further apart and new houses were erected around the estate known as Garston's (opened in 1854), Waterlands (1855), Gladstone's (1857) and Gurney's (1861). The Prince's and Duke's homes were subsequently closed. The layout of the site is shown on the 1892 map below. 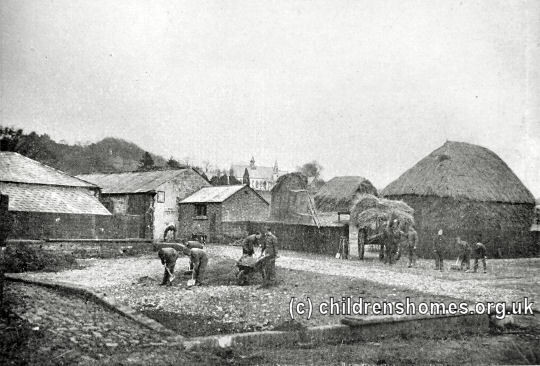 Philanthropic Society's Farm School for Boys site, Redhill, c.1892. As would be expected at a Farm School, the boys were trained in agricultural and dairy work, and farmyard management. They were also taught a variety of other skills and trades including carpentry, boot and shoe making, tailoring, bread making and baking, blacksmithing, and bricklaying. The School had its own laundry where the boys learned laundry work and did all the institution's washing. Rise 5.30 a.m. 6.0 a.m.
School or work 6.0 " 6.30 "
Breakfast and recreation 8.0 " 8.0 "
Chapel 9.0 " 9.0 "
School or work 9.30 " 9.30 "
Dinner and recreation 12.0 noon. 12.0 noon. Work 1.0 p.m. 1.0 p.m.
Recreation 5.30 " 5.30 "
Supper 6.0 " 6.0 "
School and recreation 7.0 " 7.0 "
Prayers 8.30 " 8.0 "
Bed 9.0 " 8.30 "
Tuesday Ditto. As Sunday. Ditto. (or fish, 1 lb) Ditto. Friday Ditto. As Sunday. Ditto. Milk, ¾ pint Bread, 12 oz. In winter on two meat-days, 4 oz. are allowed for soup, with 8 oz. bread and vegetables, and on the other two meat-days 8 oz. meat are supplied. Coffee is served on Sundays, and jam allowed in lieu of butter once a week. N.B.—Tea and cake are supplied for supper once a month, extra under special rules. In 1923, the School was certification as a Reformatory was revised, reducing its capacity to 150 boys. The establishment was by then known as the Philanthropic Society's School. In around 1934, the School became an Approved School for Senior Boys, one of the new institutions established under the 1933 Children and Young Persons Act to replace the previous Reformatories and Industrial Schools. The buildings suffered considerable damage from a flying bomb in 1944, but many of the old buildings were replaced after the war. In 1953, the Society became the Royal Philanthropic Society. In 1954, a Classifying School was opened at the site to provided an initial assessment facility for boys in the south-east of England who were committed to an Approved School. In 1967, a Secure Unit was added for the accommodation of 30 'difficult' boys aged 14 to 15. The Approved School (or Training Unit), Classifying School and Secure Unit each had their own management and were collectively known as the Royal Philanthropic Society Schools. The Children and Young Persons Act of 1969 replaced the Approved Schools by the Community Home with Education (CHE). In 1973, the Society's trustees took the option of becoming a 'controlled' CHE, with the running of the Home being taken on by the London Borough of Wandsworth. The Training Unit, Classifying School and Secure Unit were respectively renamed the Community Home, Regional Assessment Centre and Intensive Care Unit. In 1982-3, these three facilities were closed and replaced by a much smaller service, comprising 20 places for remand and assessment, 12 long stay places, and 8 secure places. The Society then began to sell off large portions of the Redhill estate. The CHE site was sold to a developer in 1984, and the adjoining farm, which had always been a thriving part of the School, was sold as a going enterprise. Despite growing opposition from the Redhill staff, and some outside the Society who were critical of the likely increase in young offenders having to enter the penal system, the remaining residential provision at Redhill was closed in June 1988, the Society's bicentenary year. The Society continued its work in various community-based childcare projects in Kent, Surrey and south-west London. In 1997, it merged with the Rainer Foundation, which in turn merged with Crime Concern in 2008 to become Catch22.